3813 products found in Gun Cabinets. 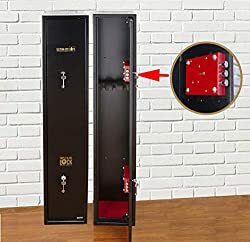 Your request for Gun Cabinets revealed a total of 63813 results. 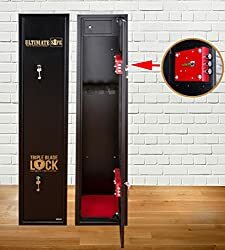 Product Features: Built to British Standard BS7558/92 for gun security, Two 7 lever locks fitted, 2 keys for each lock supplied, Anti crowbar door system. 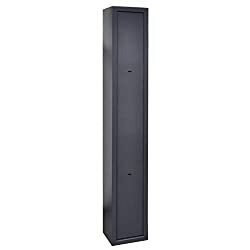 4 pre drilled holes in the back and base for securing into wall or floor, fixing bolts included, Foam gun divider, Foam Base., Suitable for 3 shotguns, Internal height 128cms (129cms without foam base) suitable gun length 125cms (or 126cms), Weight 24kgs,, Fitted with two unique Triple Blade Lock designed and created by Ultimate Safe., Approximate Dimensions of Gun Safe: Height - 130cm (4ft 3"), Width - 24.5cm (10"), Depth 20.5cm (8"). Weight: 29Kg., Suitable for up to 3 shot guns or 3 rifles. Made of finest 2.5mm Steel. Finished in durable semi-gloss black powder coat finish.